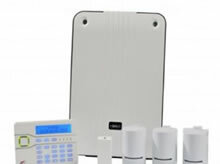 We have a wireless alarm system fully installed with dialler and setting fob forjust £450 plus Vat. Print Ltd specialises in the domestic, commercial and small industrial market installing and maintaining Intruder Alarm systems, CCTV & Door Entry systems. “Mr & Mrs. Hardiman, Shipston on Stour - Clean, efficient & friendly service. Everything was explained thoroughly. The company was recommended to us and we would recommend them to others!